Ever since Uhtred saw his adopted family being slaughtered, he’s never once questioned any amount of sacrifice to secure himself a future, one that included his return to Bebbanburg and revenge for the murder of his family. He’s sacrificed relationships with his friends and family, and worked to prove himself loyal to Alfred and the Saxons. In last week’s episode, that led him to be trusted by Alfred, thus beginning their plans for one final battle with the Danes for control of Wessex. The question then becomes, with all of Uhtred’s sacrifices in the past, how many more must he make for Wessex to be returned to Alfred and the Saxons? Sacrifice and loss permeate the episode. Sure, both themes have been relevant to the series thus far, but no episode before this finale has so profoundly woven them into the action and plot. For all intents and purposes, “Episode 8” is the battle episode, the violent climax to the rising action of the previous seven episodes. The Last Kingdom, which has shown its ability to craft striking fight scenes all season long, could have easily churned out a bloody, action-filled episode that would have served as a satisfying end to the season. Instead, the show uses the final battle to continue to push its thematic elements, and the way everything comes together during that final battle is truly spectacular. The episode quickly establishes just how high the stakes are for everyone involved. Alfred has a new confidence, but it won’t mean much if he can’t reclaim his throne, and to do that they need Odda the Younger’s army. But Odda has made a pact with the Vikings and has found peace, for now, and decries the reign of Alfred, unbeknownst to the fact that Alfred is watching amongst the crowd. The Last Kingdom chews through a ton of plot in its finale, but it’s all in service of making sure the final battle is imbued with consequence and meaning. There’s an urgency to “Episode 8,” an energy coursing through it. It’s there in the sudden and shocking death of Odda the Younger, killed by his father for being a traitor, and in the way the camera frantically moves around Uhtred’s farm, finally settling as he discovers the grave of his son. These urgent moments infuse the episode, and each of the characters, with a sense of purpose. The final battle between the Saxons and the Danes becomes more than just a clash of ideologies over land, but a story of individual motivations and plots. For Leofric, he’s intensely loyal and will follow his King anywhere. For Alfred, it is a chance to prove his worth. For Uhtred, it is not only a chance to show Alfred that he is a great warrior, but to also prove to himself that everything he’s sacrificed has been worth it. His broken friendship and love with Brida, his separation from Mildrith, and the death of his son mean nothing if he can’t win this final battle. All of that rich thematic and character work only adds to what’s a magnificently shot battle scene. The whole scene manages to find a balance between being intimate and grand in scope. The overhead shots, which show approaching front lines and patches of dead bodies, show the toll of the larger battle, while the shots from inside the shield walls establish a closeness that’s frightening and claustrophobic. Thus, the battle becomes much more than just Uhtred vs. Skorpa. There are larger ideologies and more personal motivations at play, underscored when Skorpa leaves the battle to slaughter a Saxon camp and deliver the head of Iseult to Uhtred on the front lines. It’s the final loss Uhtred can take, breaking through the shield wall and killing a number of Vikings before he, with a little help from Beocca, kills Skorpa. When the Saxons prevail then and Wessex is saved, it can’t help but feel like a bittersweet victory. 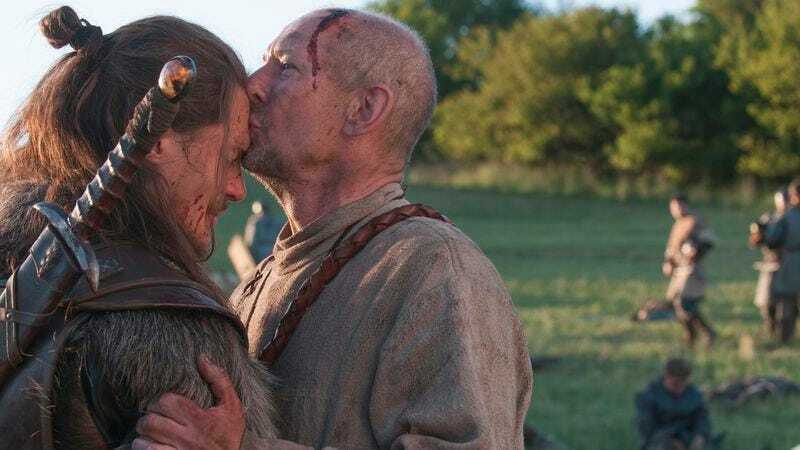 When Beocca praises Uhtred for becoming the man he always knew he could be, and gives him a hug, the tears in Uhtred’s eyes suggest more than just joy at the words his friend has spoken. They’re also tears for everything he’s lost in the process, everything he’s had to see slip away from him while he’s aligned himself with Alfred and worked towards getting Bebbanburg back in his grasp. The season finale of The Last Kingdom manages to not only be a thrilling battle episode, but also a catalyst for character and plot development that organically paves the way for a second season. Just as the episode’s earliest moments deepen the meaning of the battle between the Saxons and the Danes, the episode as a whole suggests a way forward for the show. A closing montage—which, if I’m being honest, is a little too tidy for my liking—shows everyone in a different place, changed by the battle. There’s Guthram, who’s consistent fears of the Christian God have led him to be baptized. There’s Brida and Ragnar, both hostages of the Saxons, though Ragnar still holds Uhtred close. And there’s Uhtred, the boy this season started with, riding into the sunset as a man. He’s riding to avenge all his losses, to prove once again that his sacrifices have had a purpose. He’s riding for Bebbanburg and for revenge, which is exactly where he was in “Episode 1.” By “Episode 8” though, he’s a changed man. Perhaps he’s ready to fulfill his destiny now. We’ll have to wait and see. Apologies for the late review. No advance screener, no BBC America in Canada, and an American holiday weekend means a very late review. If I have one complaint about this finale, it’s how the Saxon characters, mainly Beocca and Alfred, quickly change their personalities. It’s part of the point, that Uhtred has helped change them to win this battle, but the sudden shift in personalities, with Beocca especially, felt a little contrived to me. So long, Leofric. We’ll miss hearing your affectionate name for Uhtred. That’s it for reviews of the first season of The Last Kingdom! A genuine thanks to everyone who read and commented each week; you’ve been insightful, eager, and dare I say polite and respectful. You are the Uhtred to my Alfred; despite your initial brashness, your charm and passion have won over my cold heart. Here’s hoping we get to do this again.